Does your business need an outdoor presence? Enter BrochureHoldersNow.com's new suction cup brochure holder line. Each of the items listed here in this collection has been designed to withstand the elements while protecting your printed advertisements. 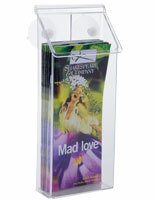 Why choose suction cup brochure holders? 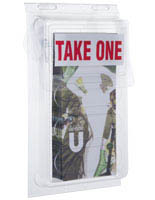 These plastic pamphlet holders are designed to stick to any smooth surface and have built-in coverage for keeping your brochures, pamphlets, and business cards dry. 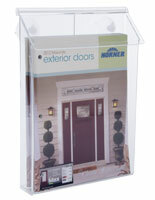 Our diverse line of outdoor literature holders are optimal for use on car windows, glass doors and business windows. 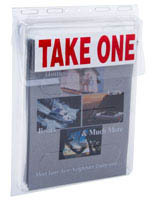 Waterproof business card holders are making a real impact in the small independent business world. The self starter knows how hard it is for him or her to make it in these competitive times. Who doesn't need a little help here and there? We all do and these young professionals are fast taking advantage of real point of place advertising. The physical trainer who works out of parks and beaches uses her advertising wrapped car as her billboard and when she is giving a bootcamp lesson she leaves brochures on her Civic. Meanwhile across town a two man cleaning business with a catchy logo on the side of their van has their pamphlets and business cards attached to their van. Both of these start-ups are taking advantage of print media in an non-traditional location. Does your business need some help thinking outside of the box? How about sticking the box, well, outside.